Berger's Bar & Grill has been serving up great food and fun since 1993. Family owned, Berger's is a great place for everyone to hang out and enjoy an award winning burger. 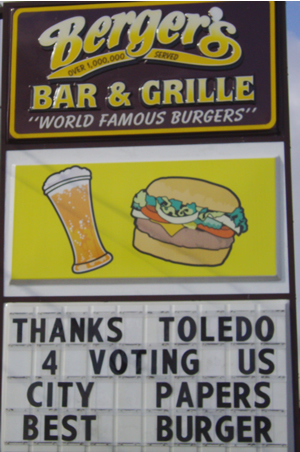 The winner of Toledo City Paper's Best Burger in 2008 and again in 2010, Berger's is a well known Toledo eatery. Berger's has even been mentioned on the front page of The Blade, twice on Jay Leno, and once on David Letterman for their funny advertisements. Located in the strip mall directly across from Kroger's at Miracle Mile, Berger's is west Toledo's laid back neighborhood restaurant that serves up great bar food.